The B.C. government's decision to increase a school tax for people who own homes valued at more than $3 million has prompted so much controversy that a town hall has had to be postponed. That postponement didn't stop Point Grey residents from rallying at Trimble Park. 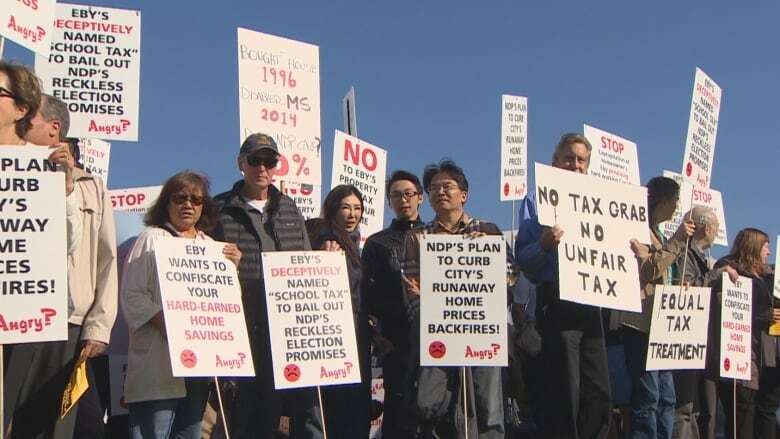 At least 200 people held a rally at Trimble Park in the upscale Vancouver neighbourhood of Point Grey Tuesday afternoon to voice their anger over the B.C. government's proposed increase to the school tax, which would increase the tax bill — some say dramatically — of homes worth more than $3 million. 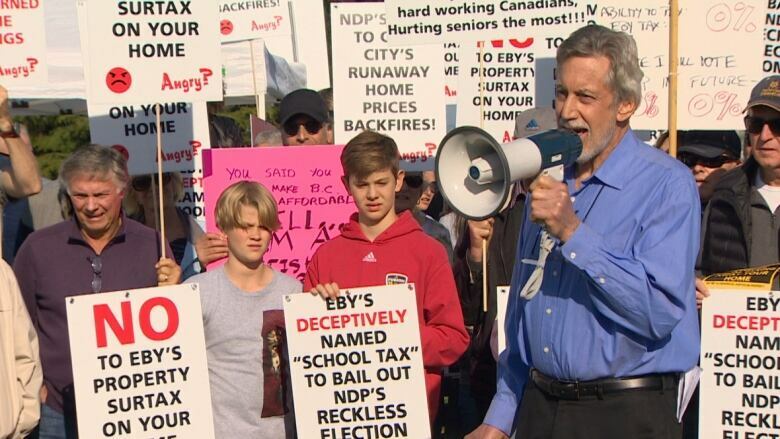 Vancouver-Point Grey MLA David Eby was set to hold a town hall on the tax increase Tuesday but cancelled those plans, he said, because a planned protest prompted security concerns around the event. 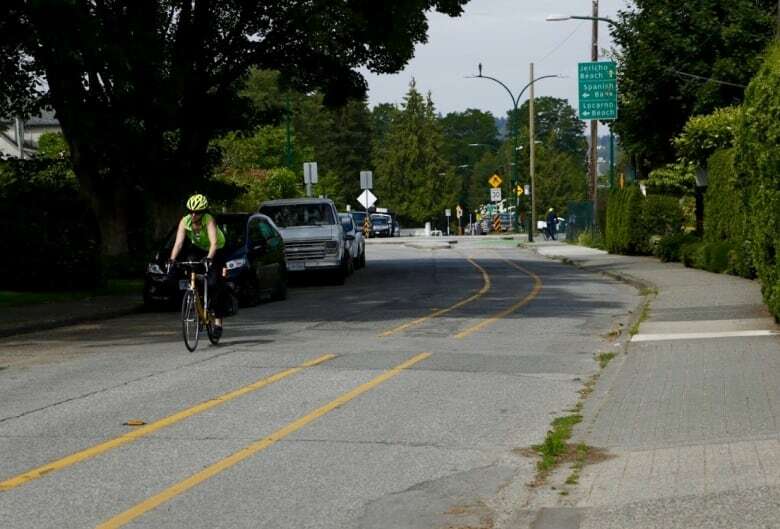 But news of the cancellation didn't sit well with his own constituents in well-heeled Point Grey, home to some of B.C. 's priciest real estate. "He is using the smokescreen of safety and that is a totally specious argument. He is a coward," said one man from the neighbourhood, David Tha. "We're being discriminated against. It's arbitrary and it's wrong. It is is simply a matter of fairness and the fairness is not there. They should be ashamed of themselves." Protesters waved signs and told stories about how the tax could force them to sell their homes. The increased tax, announced as part of the NDP's 2018 budget, would affect properties valued at more than $3 million. Eby says the increase would generate around $200 million in funding for the education system, particularly for seismic upgrades. The move has been controversial in Eby's constituency, with some homeowners arguing the tax hike is unfair. In a statement, Eby, who is also B.C. 's attorney general, said he had hoped the town hall could have been an opportunity for a community discussion about the school tax. However, he said two real estate agencies encouraged non-constituents and people without tickets to attend, and then a subsequent letter distributed by the B.C. Liberals did the same. He also said the staff at his office had been subject to verbal abuse. "People were opening the door and shouting at my staff and calling up the [constituency] office and yelling at my staff and so on. 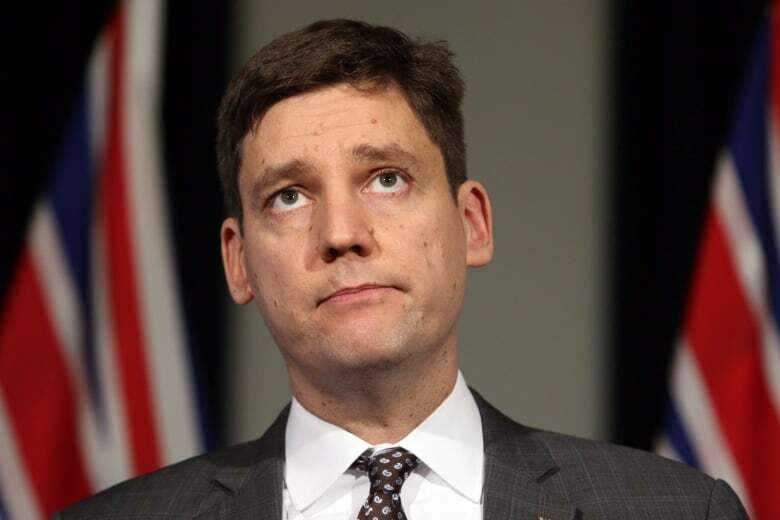 We're vulnerable at that point," Eby said. "We pressed on ... but the tactics of the opponent groups ramped up." After a protest was scheduled an hour-and-a-half before the event, Eby said they would no longer be able to secure the venue and "could not ensure safety." He postponed the event. Eby said this marks the first time in his career he has had to take such an action. Jonathan Rubenstein, a semi-retired homeowner from Shaughnessy, says his property — which is valued at $6.3 million — is not a financial asset that should be taxed by the government. "I love my neighbourhood and it's utterly unfair to look at my house as a financial asset. I don't want to sell it and it scares me to think that I might have to. But the government is telling me they're going to tax me fairly heavily and maybe drive me out of my house," Rubenstein said. Rubenstein says many of the people who live in these highly valued houses might not have the liquid income to keep up with the tax increases. Instead, he suggested increasing the tax for high-income earners as a way of generating education funding. If you are interested in housing affordability, check out CBC's new podcast, SOLD! Host Stephen Quinn explores how foreign investment in real estate divides community, class and culture. Find it at CBC Podcasts or Apple Podcasts. An earlier version of this story had an incorrect figure for the amount of money generated by the school-tax increase. The NDP estimates it will generate $200 million. The story also mistakenly described the tax as new. In fact, the change is an increase to an existing tax. An earlier version of this story understated how many people attended the rally.